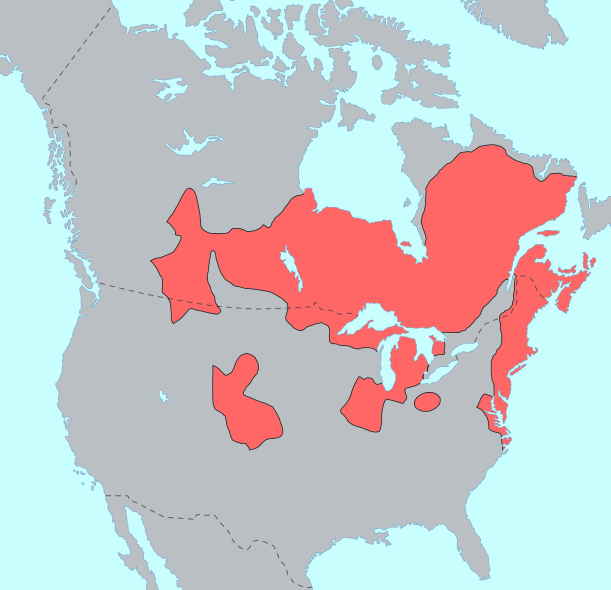 One of the most populous and widespread Native American groups, Algonquian tribes consist of peoples that speak Algonquian languages and historically shared cultural similarities. There are hundreds of original tribes that spoke several related dialects of the language group. Historically, they lived across eastern North America from the Atlantic Ocean to the Rocky Mountains and from northern Canada to the Carolinas. 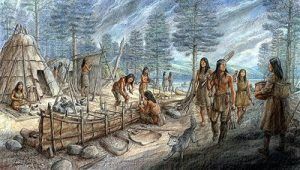 Before Europeans came into contact, most Algonquian settlements lived by hunting, trapping, and fishing and gathering roots, nuts, wild rice, fruit, and berries; although quite a few supplemented their diet by cultivating corn, beans, and squash. Some tribes also grew tobacco. Because Northern weather patterns made growing food difficult, many Algonquian tribes moved their families from place to place. They traveled on foot, in canoes made of birch bark, and used snowshoes and toboggans in the snow. Their garments, as well as their shelters, known as wigwams, were fashioned with animal skins. At the time of the first European settlements in North America, Algonquian tribes occupied much of Canada east of the Rocky Mountains; what is now New England, New Jersey, southeastern New York, and Delaware and down the Atlantic Coast through the Upper South; and around the Great Lakes in present-day Minnesota, Wisconsin, Michigan, Illinois, Indiana and Iowa. Many of the tribes were at war with the Iroquois Confederacy. The English settlements were often engaged in border wars with their Algonquian neighbors, who, continually pressed farther toward the interior by the advancing white immigration, kept up for a time a futile struggle for the possession of their territory. The eastern tribes, from Maine to the Carolinas, were defeated and their tribal organization was broken up. Some withdrew to Canada, others crossed the mountains into the Ohio Valley, while a few bands were located on reservations by the whites only to dwindle and ultimately become extinct. The Abnaki and others who fled into Canada where they settled along the St. Lawrence River under the protection of the French, whose active allies they became in all the subsequent wars with the English down to the fall of the French power in Canada. Those who crossed the Allegheny mountains into the Ohio Valley, together with the Wyandot and the native Algonquian tribes of that region, formed themselves into a loose confederacy, allied first with the French and afterward with the English against the advancing settlements with the declared purpose of preserving the Ohio River as the Indian boundary. 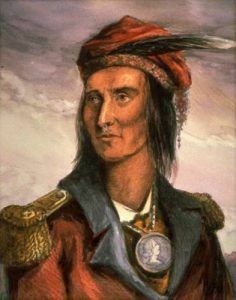 General Wayne’s victory in 1794 put an end to the struggle, and at the Treaty of Greenville in 1795 the Indians acknowledged their defeat and made the first cession of land west of the Ohio River. Shawnee Chief Tecumseh and his brother, Tenskwatawa, instigated by the British, again aroused the western tribes against the United States a few years later, but the disastrous defeat at Tippecanoe, Indiana in 1811 and the death of their leader broke the spirit of the Indians. In 1815 those who had taken part against the United States during the War of 1812 made peace with the Government; then began the series of treaties by which, within 30 years, most of the Indians of this region ceded their lands and removed west of the Mississippi River. Algonquian tribes of the New England area include Mohegan, Pequot, Narragansett, Wampanoag, Massachusett, Nipmuc, Pennacook, Abenaki, Maliseet, and Passamaquoddy. Chippewa, Ottawa, Pottawatomie, and a variety of Cree groups lived in Minnesota, Wisconsin, and Upper Michigan. 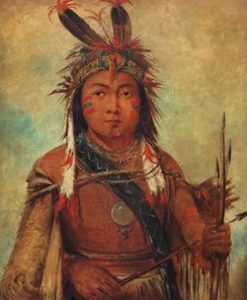 In the Midwest lived the Shawnee, Illini, Kickapoo, Menominee, Miami, and Sac and Fox. The Great Plains were called home to the Arapaho, Blackfoot, and Cheyenne. In the mid- and south-Atlantic were the traditional homes of the Powhatan, Lumbees, Nanticoke, Lenape, Munsee and Mahican peoples. Other Algonquian tribes reside in Canada. Hodge, Frederick Webb; The Handbook of American Indians North of Mexico, Bureau of American Ethnology, Government Printing Office. 1906.